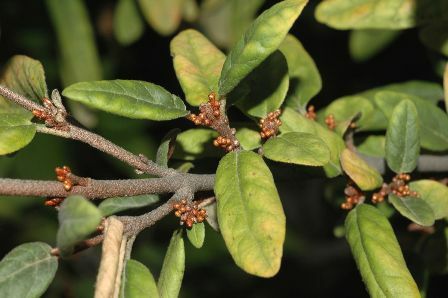 Synonyms: Elaeagnus Canadensis, Hippophe canadensis, Lepagyrea canadensis. Common names: Canadian buffaloberry, Rabitberry, Russet buffaloberry, soiapberry. 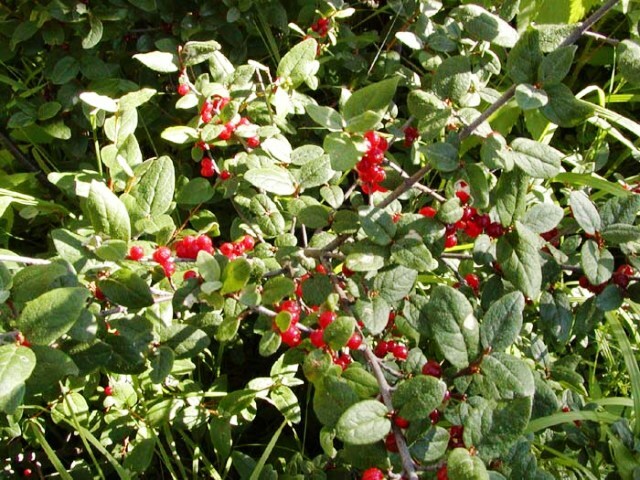 Buffaloberry can be seen growing wild on wooded banks and hillsides from Newfoundland and New York to Alaska and Oregon and southward along the Rocky Mountains to New Mexico. This plant is a native of North America. It is a very cold hardy plant. Buffaloberry is a deciduous woody shrub, growing upto 2.5 m tall, leaves shiny and from above but white from below, attractive; dioecious; flowers bright yellow. Fruits small, 5 mm wide, tart initially but become pleasant at the end of season; flavour pleasant. The fruits can also be dried and consumes like currants. Buffaloberry flowers in April. The fruits ripen from July to September. Buffaloberry can grow in all type of soils which are free from water logging. This plant can even grow in poor soils. Established plants are drought resistant. Plants can accumulate mercury when they are grown in polluted soils. Buffaloberry is propagated from seed. Seeds should not be allowed to dry and must be sown immediately in a cold frame. Stored seeds, however, will require cold stratification for 10-12 weeks for good germination. The plant can also be multiplied be multiplied from semi-hardwood cuttings taken in July. The fruit was a favourite treat of the North American Indians. They would beat it in an equal quantity of water until foam with a consistency of beaten eggs was formed. It was important that in this process the berries were not allowed to come into contact with anything greasy since this would prevent it becoming foamy. The foam would then be flavoured with a sweet food such as cooked quamash bulbs or other fruits and then served as a special treat in feasts etc. The fruits taste bitter sweet and one does not enjoy it when taking for the first time but gradually start liking them. A sweet preparation called “Indian ice cream” is prepared by adding sugar to the foam. 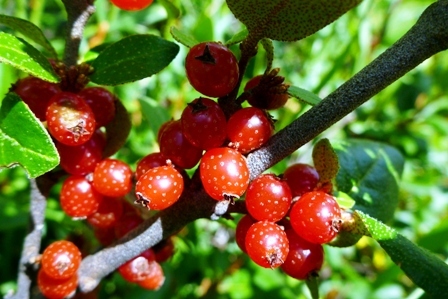 Buffaloberry was commonly employed medicinally by several native North American Indian tribes, who used it in the treatment of several complaints. A poultice of the bark, softened by hot water and mixed with pin cherry bark (Prunus pensylvanica), is used to make a plaster or bandage for wrapping broken limbs. An infusion of the bark is used as a wash for sore eyes. The roots are antihaemorrhagic and cathartic. An infusion of the roots is used as an aid to childbirth and in the treatment of tuberculosis and the coughing up of blood. A decoction of the stems has been used as a stomach tonic and also in the treatment of constipation, high blood pressure and venereal disease. A decoction of the stems and leaves has been used as a wash in the treatment of sores, cuts and swellings. A decoction of the plant has been used externally for treating for aching limbs, arthritic joints, head and face sores. 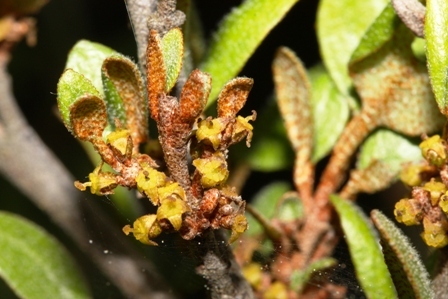 The inner bark is reported to be a laxative and its infusion has recommended as a cure for constipation. The berries are prescribed for lowering down the high blood pressure. The fruit juice has been drunk in the treatment of digestive disorders. It has also been applied externally in the treatment of acne and boils. A hair wash is also prepared from buffaloberry shoots.